Most women/men thinks that caring for their hair requires nothing more than washing on a regular basis. This isn't further from the truth. Proper hair care requires extreme caution and a gentle handling. You must take precautions on every step of the way. These includes washing of the hair and even the drying process. Below are the most common haircare mistakes that both men and women makes on a regular basis. Curls look amazing. 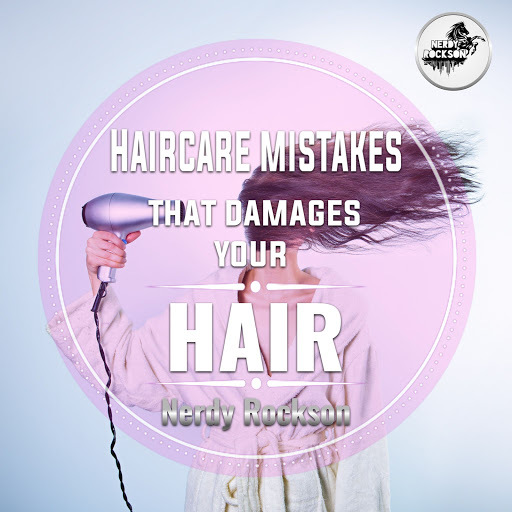 Unfortunately, it is possible to cause your hair significant damage with hot irons. This is definitely the case if you attempt to curl the hair while it is already damp. This will cause the follicles to burn and weaken. Before attempting to style your hair, let it dry completely. To speed up this process, use a blow dryer. As you should already know, the hair becomes weaker when it is wet. Simultaneously, wet hair is much more likely to become tangled. With this in mind, it is pertinent to keep your hair straight before washing. If you wash your hair without brushing, you’re going to cause serious problems in the long run. To avoid this problem, make sure you brush your hair before jumping in the shower. You can also comb the hair in the shower. If you prefer this method, make sure you use a conditioner and a wide-toothed comb. Changing your hair’s color from time to time can be very exciting. Plus, it gives you the opportunity to spice up your look. Unfortunately, the dye can be dangerous. The mass majority of hair dyes will weaken the hair. Plus, there is a possibility that you could suffer from an allergic reaction. If you are adamant that you want to dye your hair, choose wisely, and look for products that are more natural. One safe option would be henna. It is a bit tricky to dye your hair using henna without making a mess, but once you master the technique, your hair will thank you. Another thing to remember is that drying your hair incorrectly can lead to serious problems. If you rough house your hair with a towel after washing it, it is time to stop! Rubbing too much and too hard can lead to breakage. It can also put a lot of pressure on your hair and cause it to dislodge from the scalp. If you are looking for a better alternative, you should consider using a hairdryer. Believe it or not, it is definitely possible to over pamper your hair. When washing your hair, you are stripping vital oils from the locks. This can leave your hair looking lifeless and plan. While it is absolutely pertinent to shower on a daily basis, you should consider leaving your hair alone every once in a while. In fact, washing your hair every other day is generally a good idea. Anything more frequent could be problematic. Taking a good care of your hair is a simple process that only needs some knowledge and basic skills. Things, like using natural hair care products, washing your hair less frequently with warm water instead of hot water, and using an apple cider vinegar rinse, could be so powerful in giving back the healthy shine to your hair.